The goal in training competitive athletes is to provide training loads that will improve performance. During this process athletes may go through several stages that can range from ‘undertraining’, during the period between competitive seasons or during active rest and taper, to ‘overreaching’ (OR) and ‘overtraining’ (OT) which includes maladaptations and diminished compet-itive performance1-3. When prolonged, excessive training occurs concurrent with other stressors and insufficient recovery, performance decrements can result in chronic maladaptations that can lead to the ‘overtraining syndrome’ (OTS). In the beginning of 2013, a mutual consensus statement of the European College of Sports Science (ECSS) and the American College of Sports Medicine (ACSM) was published. This paper is based on that consensus statement2,3. Intensified training can result in a decline in performance. However, when appropriate periods of recovery are provid-ed, a ‘supercompensation’ effect may occur with the athlete exhibiting an enhanced performance compared to baseline levels. This can occur when athletes go on a short training camp in order to create ‘functional overreaching’ (FO). Usually athletes will show temporary performance decrements that will disappear after a taper period. In this situation, the physiological responses will compensate for the training-related stress. When this ‘intensified training’ continues, the athletes can evolve into a state of extreme overreaching or ‘non-functional overreaching’ (NFO), that will lead to a stagnation or decrease in performance which will not resume for several weeks or months. Both ‘functional’ and ‘non-functional’ overreached athletes will be able to fully recover after sufficient rest. It seems from the literature that, also in NFO, the evolution on the ‘overtraining continuum’ is not only ‘quantitatively’ determined (i.e. by the increase in training volume) but that also ‘qualitative’ changes occur (e.g. signs and symptoms of psychological and/or endocrine distress). This is in line with recent neuroendocrine findings using a double exercise test4-7. As it is possible to recover from short-term or ‘functional’ overreaching within a period of 2 weeks, the recovery from the NFO state is less clear. This is probably because not many studies have tried to define the subtle difference that exists between extreme overreaching, which needs several weeks or even months to recover2,3 and OTS. Athletes who suffer from OTS may need months or even years to completely recover, leading frequently to cessation of a (top) sports career. By using the expression ‘syndrome’ we emphasise the multifactorial aetiology and acknowledge that exercise (training) is not necessarily the sole causative factor of the syndrome. The borderline between optimal performance and performance impairment due to ‘OTS’ is subtle. This applies especially to physiological and biochemical factors. The apparent vagueness surrounding OTS is further complicated by the fact that the clinical features are varied from one individual to another, non-specific, anecdotal and numerous. Probably because of the difference in the definition used, prevalent data on over trained athletes are dispersed. Studies have reported that up to 60% of distance runners show signs of overtraining during their careers, while data on swimmers vary between 3 to 30%8-11. If the definition of OTS as stated above is used, the incidence figures will probably be less high. We therefore suggest that the distinction be made between NFO and OTS and to only define athletes as suffering from OTS when a clinical exclusion diagnosis establishes OTS. Although in recent years the knowledge of central pathomechanisms of OTS has significantly increased, there is still a strong demand for relevant tools for the early diagnosis of OTS. OTS is characterised by a ‘sports-specific’ decrease in performance, together with persistent fatigue and disturbances in mood state2,3,12-14. One approach to understanding the aetiology of OTS involves the exclusion of organic diseases or infections and factors such as dietary caloric restriction (negative energy balance) and insufficient carbohydrate and/or protein intake, iron deficiency, magnesium deficiency, allergies etc, together with identification of initiating events or triggers2,3. One of the most certain triggers is a training error resulting in an imbalance between load and recovery. Other possible triggers might be the monotony of training15, too many competitions, personal and emotional (psychological) problems and emotional demands of occupation. Less-commonly cited possibilities are altitude exposure and exercise-heat stress. The scientific evidence for most of these potential triggers is not strong. Many other triggers such as glycogen deficiency or infections16 may contribute to NFO or OTS, but might not be present at the time the athlete presents to a physician. There are many reports on upper respiratory tract infections due to increased training and also in OR and OTS athletes. It seems feasible that intensified training (leading to OR or OTS) may increase both the duration of the so-called ‘open window’ and the degree of the resultant immunodepression. However, the amount of scientific information to substantiate these arguments is limited. More data are available that each bout of prolonged and intensive exercise has transient but significant wide-ranging effects on the immune system17,18. A hallmark feature of OTS is the inability to sustain intense exercise and a decreased sports-specific performance capacity when the training load is maintained or even increased6,19. It appears that both the type of performance test employed and the duration of the test are important in determining the changes in performance associated with OTS. Debate exists as to which performance test is the most appropriate when attempting to diagnose OR and OTS. Urhausen et al4 and Meeusen et al6,7 have shown that multiple tests carried out on different days4 or which use the two maximal incremental exercise tests separated by 4 hours6,7 can be valuable tools to assess the performance decrements usually seen in OTS athletes. A decrease in exercise time of at least 10% is necessary to be significant. Furthermore, this decrease in performance needs to be confirmed by specific changes in hormone concentrations6,7. A variety of measurement tools have been developed to accurately monitor training load and quantify recovery rate. An important feature of these measurement tools is that they should be easy to administer, non-invasive and sensitive to change. Ratings of perceived exertion offer a valuable determinant of impending fatigue during exercise testing and are widely accepted as an effective tool for prescribing aerobic exercise intensity. Foster et al15 introduced the concept of session ratings of perceived exertion (sRPE), in which an individual subjectively estimates the overall difficulty of an entire workout after its completion. Green20 noted that sRPE may prove useful in evaluating recovery across exercise sessions, but more work is needed to determine the precision of this measure and to further elaborate the physiological as well as psychological factors influencing sRPE. The measurement of recovery heart rate has also been proposed as a valuable tool. Lamberts et al21 showed that the chosen exercise intensity of a submaximal test should elicit a heart rate of between 85 to 90% of heart rate maximum because the lowest day-to-day variations were found at this intensity. From test to test a change in heart rate recovery of more than 6 bpm or a change in submaximal heart rate of more than 3 bpm can be regarded as a meaningful change under controlled conditions. These changes can be caused by an improved/decreased training status or the accumulation of fatigue as a result of functional overreaching21. Most of the blood parameters (e.g. blood count, C-reactive protein, sedimentation rate, creatine kinase, urea, creatinine, liver enzymes, glucose, ferritin, sodium, potassium etc) are not capable of detecting OR or OTS, but they are helpful in providing information on the actual health status of the athlete and are therefore useful in the ‘exclusion diagnosis’2,3. Many studies have tried to couple OTS to a disturbance of the endocrine systems. It is, however, not sufficient to know the effect of a hormone to actually understand its actual role in metabolic control. Each hormone has a pre-defined exercise-induced pattern. When investigating hormonal markers of training adaptation it is therefore important to target specific hormones for their informational potential and synchronise their sampling in accordance with their response patterns. Recent research findings6,7,22 support that athletes experiencing maladaptive training and performance adaptation problems seem to suffer from a dysfunctional hypothalamic-pituitary-adrenal axis (HPA) response to exercise, resulting in an altered hormonal response to intense training and competition. When investigating elite athletes, the HPA axis is believed to offer valuable information about an athlete’s state of adaptation23. Meeusen et al6,7 published a test protocol with two consecutive maximal exercise tests separated by 4 hours. With this protocol they found that in order to detect signs of OTS and distinguish them from normal training responses or functional overreaching, this method may be a good indicator not only of the recovery capacity of the athlete but also of the ability to normally perform the second bout of exercise. The use of two bouts of maximal exercise to study neuroendocrine variations showed an adapted exercise-induced increase of adrenocorticotropic hormone, prolactin (PRL) and GH to a two exercise bout6,7. The test could therefore be used as an indirect measure of hypothalamic-pituitary capacity. In a FO stage, a less pronounced neuroendocrine response to a second bout of exercise on the same day is found6, while in a NFO stage the hormonal response to a two-bout exercise protocol shows an extreme increased release after the second exercise trigger7. With the same protocol it has been shown that athletes suffering from OTS have an extremely large increase in hormonal release in the first exercise bout, followed by a complete suppression in the second exercise bout6,7. This could indicate a hypersensitivity of the pituitary followed by an insensitivity or exhaustion afterwards. Early detection of OR may be very important in the prevention of OTS. However, testing of central hypothalamic/pituitary regulation requires functional tests which are considered invasive and require diagnostic experience and these tests are time-consuming and expensive. There is general agreement that OTS is characterised by psychological disturbances and negative affective states. It has been suggested that, though psychological processes underpinning OTS are important, the phenomenon occurs only when these psychological processes are combined with a negative training adaptation24. When athletes suffer from OTS, they typically experience chronic fatigue, poor sleep patterns, a drop in motivation, episodes of depression and helplessness. Not surprisingly, their performance is considerably impaired. Full recovery from OTS represents a complex process that may necessitate many months, or even years, of rest and removal from sport25,26. Several questionnaires, such as the Profile of Mood States (POMS)27, Recovery-Stress Questionnaire (RestQ-Sport)25, Daily Analysis of Life Demands of Athletes (DALDA)28 and the “self-condition scale”5 have been used to monitor psychological parameters in athletes. Other tests, such as attention tests (finger pre-cuing tasks)29 or neurocognitive tests30, also serve as promising tools to detect subtle neuro-cognitive disturbances registered in OR or OTS athletes. It is important to register the current state of stress and recovery and to prospectively follow the evolution for each athlete individually25,27. The great advantage of psychometric instruments is the quick availability of information25, especially since psychological disturbances coincide with physiological and performance changes and they are generally the precursors of neuroendocrine disturbances. In OTS the depressive component is more expressed than in OR13. Changes in mood-state may be a useful indicator of OR and OTS, however, it is necessary to combine mood disturbances with measures of performance and monitor the general health status of the athlete. The need for definitive diagnostic criteria for OTS is reflected in much of the ‘overreaching’ and ‘overtraining research’ by a lack of consistent findings. There are several criteria that a reliable marker for the onset of OTS must fulfil: the marker should be sensitive to the training load and ideally, be unaffected by other factors (e.g. diet). Changes in the marker should occur prior to the establishment of OTS and changes in response to acute exercise should be distinguishable from chronic changes. Ideally, the marker should be relatively easy to measure and not too expensive. However, none of the currently available or suggested markers meets all of these criteria2,3. When choosing several markers that might give an indication of the training or ‘overtraining’ status of the athlete, one needs to take into account several possible problems that might influence decision-making. When testing the athlete’s performance, the intensity and reproducibility of the test should be sufficient to detect differences (max test, time trial, 2 max tests). Baseline measures are often not available and therefore the degree of performance limitation may not be exactly determined. Many of the performance tests are not sports-specific. Heart rate variability seems a promising tool in theory, but needs to be standardised when tested and at present does not provide consistent results. A performance decrease with more than 10% on two tests separated by 4 hours can be indicative of OTS, if other signs and symp-toms are present. Biochemical markers, such as lactate or urea, as well as immunological markers, do not have consistent reports in the literature to consider these as absolute indicators for OTS. Many factors affect blood hormone concentrations. These include factors linked to sampling conditions and/or conservation of the sampling: stress of the sampling, intra- and inter-assay coefficient of variability. Others such as food intake (nutrients composition and/or pre- vs post-meal sampling), can significantly modify either the basal concentration of some hormones (cortisol, DHEA-S, total testosterone) or their concentration change in response to exercise (cortisol, GH). Diurnal and seasonal variations of the hormones are important factors that need to be considered. In female athletes, the hormonal response will depend on the phase of the menstrual cycle. Hormone concentrations at rest and following stimulation (exercise = acute stimulus) respond differently. Stress-induced measures (exercise, pro-hormones, etc) need to be compared with baseline measures from the same individual. Poor reproducibility and feasibility of some techniques used to measure certain hormones can make the comparison of results difficult. Therefore the use of two maximal performance (or time trial) tests separated by 4 hours could help in comparing the individual results. Psychometric data always need to be compared with the baseline status of the athlete. The lack of success induced by a long-term decrement of performance could be explained by the depression in OTS. The differences between self-assessment and the questionnaires, given by an independent experimenter and the timing of the mood-state assessment, are important. Questionnaires should be used in standardised conditions. Other psychological parameters different from mood-state (attention-focussing, anxiety) might also be influenced. Athletes and the field of sports medicine in general would benefit greatly if a specific, sensitive, simple, diagnostic test existed for the identification of OTS. At present no such test meets these criteria, but there certainly is a need for a combination of diagnostic aids to pinpoint possible markers for OTS. In particular, there is a need for a detection mechanism for early triggering factors. Therefore, a flowchart as presented in the ACSM-ECSS ‘consensus statement’ could help to establish the exclusion diagnosis for the detection of OTS. Also, the psychological screening of athletes27 and the ratings of perceived exertion15,26 have received more and more attention recently. One of the disadvantages of the traditional ‘paper and pencil’ method is that data collection can be complicated and that immediate feedback is not always possible. Another problem is that when athletes are at an international training camp or competition, immediate ‘data computing’ is not possible. It might therefore be useful to have an ‘online’ training log which has specific features for detecting not only slight differences in training load, but also the subjective parameters (muscle soreness, mental and physical well being) that have been proven to be important in the detection of OTS. A difficulty with recognising and conducting research on athletes with OTS is defining the point at which OTS develops. The physical demands of intensified training are not the only elements in the development of OTS. It seems that a complex set of psychological factors are important in the development of OTS, including excessive expectations from a coach or family members, competitive stress, personality structure, social environment, relationships with family and friends, monotony in training, personal or emotional problems and school- or work-related demands. While no single marker can be taken as an indicator of impending OTS, the regular monitoring of a combination of performance, physiological, biochemical, immunological and psychological variables would seem to be the best strategy to identify athletes who are failing to cope with the stress of training. Much more research is necessary to get a clear-cut answer to the origin and detection of OTS. We therefore encourage researchers and clinicians to report as much as possible on individual cases of athletes that are underperforming and by following the exclusion diagnosis, find that they are possible suffering from OTS. Meeusen R, Duclos M, Gleeson M, Rietjens G, Steinacker J, Urhausen A. Prevention, diagnosis and the treatment of the Overtraining Syndrome. Eur J Sport Sci 2006; 6:1-14. Meeusen R, Duclos M, Foster C, Fry A, Gleeson M, Nieman D et al. Prevention, diagnosis and treatment of the overtraining syndrome: joint consensus statement of the European College of Sport Science and the American College of Sports Medicine. Med Sci Sports Exerc 2013; 45:186-205. Meeusen R, Duclos M, Foster C, Fry A, Gleeson M, Nieman D et al. 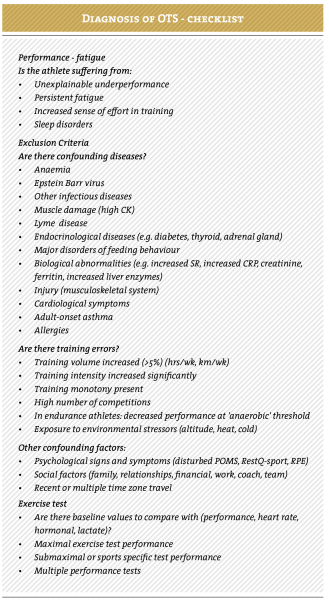 Prevention, diagnosis and treatment of the Overtraining Syndrome. Eur J Sport Sci 2013; 13:1-24. Urhausen A, Gabriel H, Kindermann W. Impaired pituitary hormonal response to exhaustive exercise in overtrained endurance athletes. Med Sci Sports Exerc 1998; 30:407-414. Urhausen A, Gabriel H, Weiler B, Kindermann W. Ergometric and psychological findings during overtraining: a long-term follow-up study in endurance athletes. 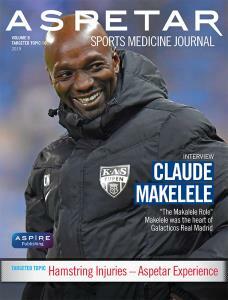 Int J Sports Med 1998; 19:114-120. Meeusen R, Piacentini MF, Busschaert B, Buyse L, De Schutter G, Stray-Gundersen J. Hormonal responses in athletes: the use of a two bout exercise protocol to detect subtle differences in (over)training status. Eur J Appl Physiol 2004; 91:140-146. Meeusen R, Nederhof E, Buyse L, Roelands B, de Schutter G, Piacentini MF. Diagnosing overtraining in athletes using the two bout exercise protocol. Br J Sports Med 2010; 44:642-648. Morgan WP, Brown DR, Raglin JS, O’Connor PJ, Ellickson KA. Psychological monitoring of overtraining and staleness. Br J Sports Med 1987; 21:107-114. Lehmann M, Foster C, Keul J. Overtraining in endurance athletes: a brief review. Med Sci Sports Exerc 1993; 25:854-862. Hooper S, MacKinnon L, Hanrahan S. Mood states as an indication of staleness and recovery. Int J Sport Psych 1997; 28:1-12. Raglin JS, Morgan WP. Development of a scale for use in monitoring training-induced distress in athletes. Int J Sports Med 1994; 15:84-88. Urhausen A, Kindermann W. Diagnosis of overtraining – what tools do we have? Sports Med 2002; 32:95-102. Armstrong LE, VanHeest JL. The unknown mechanisms of the overtraining syndrome. clues from depression and psychoneuroimmunology. Sports Med 2002; 32:185-209. Halson SL, Jeukendrup AE. Does overtraining exist? An analysis of overreaching and overtraining research. Sports Med 2004; 34:967-981. 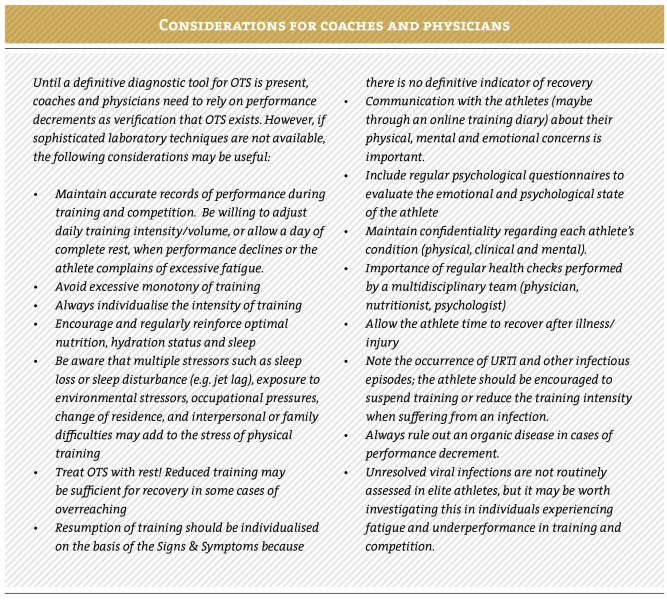 Foster C. Monitoring training in athletes with reference to overtraining syndrome. Med Sci Sports Exerc 1998; 30:1164-1168. Rowbottom DG, Keast D, Goodman C, Morton AR. The haematological, biochemical and immunological profile of athletes suffering from the overtraining syndrome. Eur J Appl Physiol Occup Physiol 1995; 70:502-509. Gleeson M. Immune function in sport and exercise. J Appl Physiol 1985; 103:693-699. Nieman DC. Immune response to heavy exertion. J Appl Physiol 1997; 82:1385-1394. Urhausen A., Gabriel H, Kindermann W. Blood hormones as markers of training stress and overtraining. Sports Med 1995; 20:251-276. Green JM, Yang Z, Laurent CM, Davis JK, Kerr K, Pritchett RC et al. Session RPE following interval and constant-resistance cycling in hot and cool environments. Med Sci Sports Exerc 2007; 39:2051-2057. Lamberts RP, Lambert MI. Day-to-day variation in heart rate at different levels of submaximal exertion: implications for monitoring training. J Strength Cond Res 2009; 23:1005-1010. Barron JL, Noakes TD, Levy W, Smidt C, Millar RP. Hypothalamic dysfunction in overtrained athletes. J Clin Endocrinol Metab 1985; 60:803-806. Steinacker JM, Lehmann M. Clinical findings and mechanisms of stress and recovery in athletes. In: M. Kellmann (ed) Enhancing Recovery: Preventing Underperformance in Athletes. 103 - 118, Champaign, Il: Human Kinetics, 2002. Silva J. An analysis of the training stress syndrome in competitive athletics. J Appl Sport Psychol 1990; 2:5-20. Kellmann M (ed). Enhancing recovery: preventing underperformance in athletes. Human Kinetics; Chapmaign IL, 2002. Kentta G, Hassmen P. Overtraining and Recovery. Sports Med 1998; 26:1-16. Morgan WP, Costill DL, Flynn MG, Raglin JS, O'Connor PJ. Mood disturbance following increased training in swimmers. Med Sci Sports Exerc 1988; 20:408-414. Halson SL, Bridge MW, Meeusen R, Busschaert B, Gleeson M, Jones DA et al. Time course of performance changes and fatigue markers during intensified training in trained cyclists. J Appl Physiol 2002; 93:947-956. Rietjens GJ, Kuipers H, Adam JJ, Saris WH, Van Breda E, Van Hamont D et al. Physiological, biochemical and psychologival markers of strenuous training-induced fatigue. Int J Sports Med 2005; 26:16-26. Kubesch S, Bretschneider V, Freudenmann R, Weidenhammer N, Lehmann M, Spitzer M et al. Aerobic endurance exercise improves executive functions in depressed patients. J Clin Psychiatry 2003; 64:1005-1012. Armstrong LE, Van Heest JL. The unknown mechanisms of the overtraining syndrome: clues from depression and psychoneuroimmunology. Sports Med 2002; 32:185-209.